Adepts have told us that yoga can be found in anything. But does that mean that anything can be yoga? With all the mixing and combining of yoga with other activities going on these days, the line between what constitutes a yoga practice and what does not has certainly become blurred and invites us to wonder why so many people find yoga insufficient on its own. A quick google search reveals an array of hybrids and pairings: yoga and pilates, yoga and fitness, yoga and martial arts, yoga and capoeira, yoga and wine, yoga and chocolate, yoga and weight-loss, yoga and writing, yoga and whatever someone can think of to try and create a niche for themselves. The trend is understandable. Niche marketing in today’s economy is often essential to survival. However, there comes a point where being all-inclusive and marketing anything under the sun as enhancing a “yoga lifestyle” ends up sacrificing the real benefit of yoga practice. Of course, there is the supposed silver lining that even if yoga is being exploited, these ploys are still exposing people to yoga; but this is really nothing more than a red herring. As many of these potentially yoga-related pursuits are becoming more popular, they are also becoming an obstacle to people actually learning yoga and understanding the role of yoga as a true wellness profession. Anyone who is able to see past all the noise, including a growing number of doctors and scientists, will attest to the healing capabilities of authentic yoga practice. But if there are only hybrids and gimmicks available then where will actual yoga practice be found? A particular example of where the dilution of yoga can be misleading and even detrimental is the newer phenomenon of grafting yogic ideas onto interpretive dance and remnants of the 90′s rave scene. “Trance yoga dance” is becoming common at yoga centers and even caused a bit of controversy at the last international yoga conference. Some studios are now offering “yoga raves” where after everyone is feeling good from a rigorous physical practice they put on some loud techno music and dance into blissful ecstasy. Certainly nothing altogether harmful about that, probably better to be blissed-out on yoga than on MDMA; the only issue is conflating this yoga trance dancing with learning Hatha Yoga. When I was thirteen years old, I was notorious for being the only boy who would dance at a party. Consequently, I think I may have attended more Bar Mitzfa’s that year then any other boy previously in the history of the San Fernando Valley of California. I’ve never been ashamed to admit that I love to dance. I took college level courses in experimental movement, attended contact improv jams and undulated myself into primordial trance states. As 1992 rang new, I shared in ecstasy-induced communal bliss with thousands of youths in a giant warehouse in downtown Los Angeles. And I can say definitively that getting out of my head on the dance floor, whether my dance moves consist of yoga poses or not, is not even close to the same thing as learning to employ the tools of yoga practice as a genuine form of self-care and personal inquiry. Overcoming the profound obstacles that life inevitably presents and discovering a sense of harmony through an inner vision and outer display of actions and attitudes requires more than the sweaty zeal of techno music and the slogan “follow your bliss” can ever offer. When the senses are overloaded, the essential attention to experience is missing. It is like trying to have a nuanced conversation with a friend in a loud bar when you have to scream to be heard. Or, as if there were a doting lover sitting across from you at a romantic candle-lit dinner but you’re on your iphone checking email out of habit. 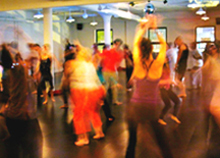 As yoga classes more and more resemble yoga raves, fewer people are learning yoga in them. When yoga practice is left sparse, without other distractions, it challenges us to be more intimate with ourselves and honest in what we discover. Of course, this is the very thing that many us would much rather avoid. When something is amiss in ourselves or our environment, clarity is not always desirable. Intense physical challenge and a bombardment of the senses are appealing because they gets us “out of our heads” in the same way that trance dancing might. An actual practice of yoga will naturally find its way into everything else, maybe even trance dancing. But in order to have yoga in all things, we must first learn yoga. No one is going to learn yoga if we don’t, at least, turn down the music a bit and pay closer attention to what we are doing. And we must not confuse what it means to learn yoga as a healing modality with what it means to celebrate yoga in other activities. Having dance parties is fine, but attempting to multitask and advertise yoga into everything causes us to miss the point. And it debases the profession. Yoga needs to die as a career path. Too many 200 hour plebs running the show. What that leaves: More for ME! More for ME! thanks for this. “noise” and “bombardment” are the right words, ways to deny the senses rather than exploring them, or enjoying their expression. this article is so boring. I read: ’80s Yoga—mellow hatha style, take child’s pose in between every pose, never does the teacher ambush you into an adjustment, no good yoga in that class ever happening before its time. What’s that you say? Day-glo leotards? Often forgotten in the very use of the word”yoga” are the eight steps outlined in Patanjali’s Sutras wherein asana is simply a posture in which one can sit comfortably with the spine erect and the goal IS yoga — unification of individual consciousness with Universal Consciousness. I like my yoga plain and without labels. This article brings up really wonderful points. As a teacher that combines yoga with “fill in the blank”, my goal is to help people bring awareness and mindfulness to their everyday activities through yoga. I agree that too many of us are too busy reaching out to our iPhones than the people sitting around us. I think a lot of people have stopped paying attention to what is around them and more attention to what isn’t. Adding yoga to a favorite activity, I believe, helps to make that activity more enjoyable – if not only to help the body prepare for a physical activity. However, Yoga and dance parties? I agree that the “grounding” work done in a good yoga practice is probably undone when “losing yourself” on the dance floor. But really, to each his own. Yoga is about is creating awareness of the Self and how we relate to what surrounds us at every moment. There is nothing wrong with enjoying a glass of wine, spirits or a couple of bottles of beer, for goodness sake. No one is advocating getting stinking drunk. I’m rather lucky that I was raised doing yoga, because it turns out that I end up “old school.” No music in classes, no competition, doesn’t matter what you wear, everyone works at their level no matter what, lots of prop use, and encouragement to practice independently. But, here is my mix. A group of friends and I are going to run the Tough Mudder (toughmudder.com). Most of us are yoga practitioners. I am also currently really crappy at parkour, but I think parkour will help me get through the TM. And so my friends are I are going to learn parkour and then follow up with a yoga class. My parkour teacher is going to help us out. We are charging $15/session to cover prop-use costs and pay the parkour teacher. It’s a 2 hr session (first hour is parkour, second hour is yoga). Each yoga teacher in the group is going to teach on rotation (so far, three of us). It’s open to students and we’re going to open it up to the public as well — which means marketing. AND MIXING! I am psyched: Tough Guy/Gal Wellington 2013; Tough Mudder Melbourne 2014! Not to discount the pairings of “yoga and pilates” and “yoga and fitness”, though … it is precisely a few classes in YogaFit (by Beth Shaw, and taught in certain semi-upscale gyms) that brought me to a studio. I never returned to “the gym” to take up yoga again, despite fallings-out with several studios. Somehow, I intuited that pilates goes well with yoga, when I’d first viewed Sadie Nardini’s videos on YouTube. She claimed the yoga was for “weight loss” … not very likely at my age and with my metabolism without calorie restriction; however, I did not throw out the baby with the bath water … I detected a lot of “standing-up style” pilates in nearly every movement. Some long time later, I sought out classical mat pilates studios … the supine pilates worked well in my home yoga asana practice (the vast bulk of my yoga practice), but I was ready to go further with it … creating my own proprietary fusion style of yoga … no more than 35% of it will ever be pilates …. Proprietary fusion style of yoga? Lame. What is it they say about opinions? And how everybody has one? There is actually a lot in common between Pilates and yoga, because supposedly Pilates studied yoga (among many other things) to create his proprietary namesake form of fitness. So, I think mixy-mixy is inevitable between these two. Also, I do this crazy thing about following modern sports/exercise/movement science. So, I study that stuff as it comes around, and learn more about the body, and mixy-mixy it into the traditional forms of yoga. Which, I think, is great because it means that people are less likely to get injured. And I have a preference for that. Seriously, I’m telling you, Melbourne 2014. I know it’s a travel for you (or, I think it is. I imagine you are in North America.). What does yoga have to do with it though? Arguably it was just a rave the proceeds of which were donated. The money went to a good cause, but yoga had very little to do with it. Yes indeed … what does it have to do with yoga? Granted it’s a yoga community having the event, but it depends on one’s point of view of: what yoga is. For some it seems yoga fulfills an outward directed self-expression + feel good/bliss/positivity thing. Then there are others who seem to direct yoga at physical and/or internal process. As far as my understanding of yoga goes, the physical practice was directed at preparing the body physiologically for long duration meditation as well to prepare the mind for the withdrawal of one’s awareness from the inputs of the sensory world. A rave (with body art and glow sticks and lasers and music) seems to me as the opposite of preparing for dhyana and samadhi. Maybe the single most important reason for the mix yoga is going through is that in the west (this is an assumption and also a generalization) there aren’t many yoga teacher that could claim that they reached a level of illumination through practicing yoga (if any). Most of the big names in western yoga certainly did not (could have been nice to be wrong on this point). So everyone is very busy inventing and trademarking new ways and new names to make a quick buck or just for the fun of it or because they really believe they are doing something good (which in most cases they are). Teaching people to relax, to have inner peace and to be flexible is positive, but has little to do with experiencing illumination states, non-ordinary states of consciousness and oneness with the universe. Being vegetarian, vegan, healthy, etc… might be good but it is not a prerequisite. My personal experience is that most yoga students don’t really believe that they can access illumination states, again, not to their fault, it is just not available to them and thus it is discarded. Students and teachers that did not have these special experiences create their own personal expression of what they think is right, and that’s ok. However that is a not replacement for the real experience that is accessible and available. The real experience calls for a deeper inner search and finding someone that has been there and wants to share. (ignoring situations of natural illumination that apparently do happen). In my view, if it is based on the traditional way or some new way it does not really matter as long as it really leads to the experiencing illumination. (the quick route is spontaneous illumination that apparently does happen but it is not the case here). In my view, if the class is based on the traditional way or some new way it does not really matter as long as it really leads to experiencing the multiple stages of growing illumination which are clearly defined by those who reached these stages of development. If you haven’t felt it you did not experienced it….and your search should continue (if you want it). Your points are valid, but here is how I view the Yoga Rave. I love to dance, but all the places I have found to go out dancing in California are either bars, or require a dance partner. They are always full of younger people and I feel out of place. I also do not drink and the Yoga Rave idea sounds like a fun place for me to dance and do yoga. It’s clean fun for those of us who don’t fit in to the typical dance scene. In the early 80s I went to gay discos because I could dance for hours by myself. I do understand that this is not the practice to become “centered” but to occasionally have fun and let off steam in a safe environment. Dancing is great, love dancing and that’s a good pro point.